Featuring 5.5inch 720 x 1440 resolution display on the 2.5D Curved Glass body, the A3 phone as technology fashion pioneer uses a 12MP+5MP dual OV camera setup, and it is equipped MT6739 1.5GHz high-performance processor and Android 8.1 os, to handle your daily tasks with ease, offering a power boost compared to previous generation. 3300mAh battery with low consumption is for full-day use, and 12MP + 5MP dual cameras deliver excellent photos, two ways to unlock your phone just a glance, global LTE bands is available in most of world’s countries. 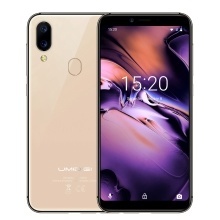 UMIDIGI A3 uses a 12MP+5MP dual OV camera setup, driven by a large F/2.0 aperture, 1.25 μm large pixels, OV12870 sensor, to capture shoots with richer colors and less noise. The 8MP Selfie shooter offers the possibility to get nice selfies and make high quality video calls, either for having fun with friends. Triple slot, 2 Nano SIMs+Micro-TF, supports up to 256GB micro-TF card, store more, delete less. The 18:9 format 5.5inch advanced in-cell technology full-screen display, UMIDIGI A3 will fit your hand like a glove, delivering the perfect experience of one-handed operation. Equipped with a MT6739 Quad-Core 1.5GHz Quad-Core A53 64-bit processor, the UMIDIGI A3 is able to handle your daily tasks with ease. UMIDIGI A3 supports more than 15 LTE bands, which means you can take it have a global round travel.